Hope you all had a very merry holiday season! I want to take a moment to look back at Dungeons and Donations, as well as other gaming highlights from the year. The 24-hour twitch streamed event for extra life was a resounding success! The event raised over $2000 dollars for children’s hospitals and doubled the event goal. 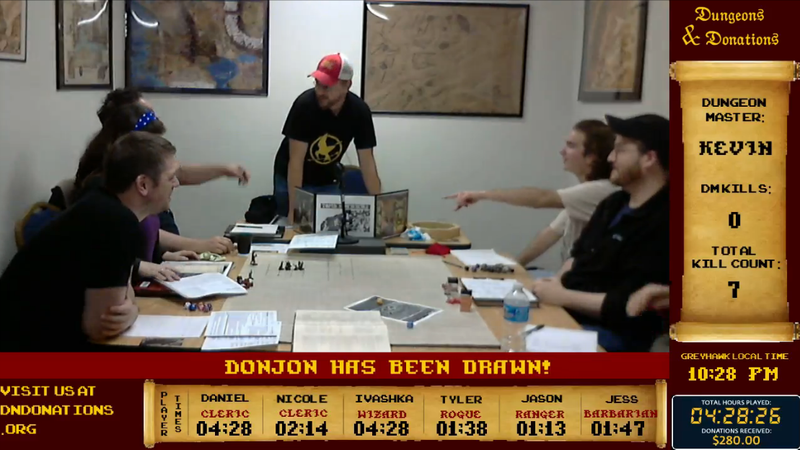 The stream used an old-school D&D video game look from the old SSI Gold Box games like Pool of Radiance and Curse of the Azure Bonds, and was really fun to watch players grapple with the challenges posed by a 5e Tomb of Horrors! For those who missed the event, you can watch the archived streams here. Donors could grant the table either a boon, a bane, or a draw from the deck of many things with their donation. 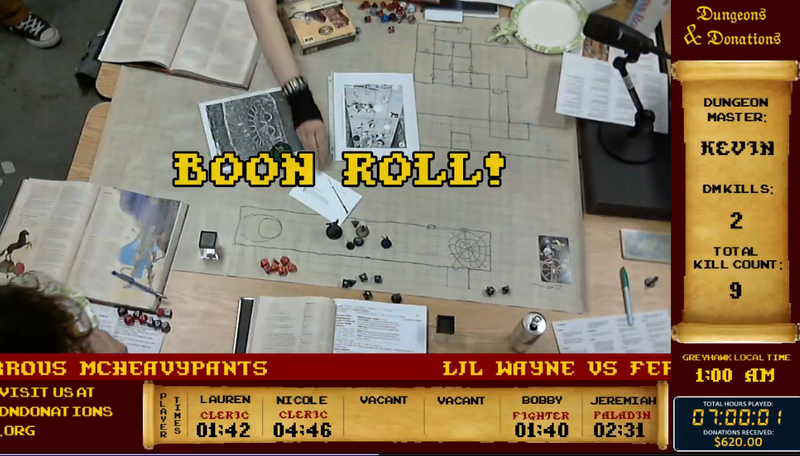 It was great fun to follow the progress of the party on the map, and see what came up from the deck or boon and bane rolls. This year saw the official release of D&D 5e. The long public beta and feedback period paid big dividends, resulting in a new system that leverages the lessons and mechanics that have been developed over the last 40 years, while remaining reverent to the spirit and the lore that makes the game such an iconic part of RPG history. The newest edition is both accessible for new players and old, and flexible enough to allow you to play D&D how you want to play it. The beginner box proved to be a pretty great value, even for veteran D&D players. Another big game came out this year: Age of Rebellion for the FFG Star Wars RPG. Using the same system as Edge of the Empire, Age really shines for those Star Wars players looking for the classic rebels vs. empire experience from the original movies. I haven’t been able to play enough of this game yet, but look forward to in the coming year. This year the Skyland Games crew played a lot of Pathfinder, Star Wars and DCCRPG conversions of 1e adventures. I expect the guys may move towards playing more 5e in the new year, and with the DCCRPG kickstarters now shipping their box sets and dice there will be more opportunities to have some great games on the Purple Planet or dealing with that Chained Coffin! What are you looking forward to playing? How was your year in gaming? This post, brought to you by Guest Blogger, and resident gamer girl, Brett! Would you like to give back a little this Holiday season? Pay it forward? Do the right thing? Milk of human kindness and all that stuff! It’s called DUNGEONS & DONATIONS! Our local Gaming establishment – The Wyvern’s Tale, is having a 24 hour Pen and Paper Game-a-Thon for the Children’s Miracle Network! HERE’S THE BLURB! The evil lich Acererak has kidnapped the children of Greyhawk, and holds them hostage within his Tomb of Horrors! Heroes throughout the land journey to their rescue–will you answer the call? 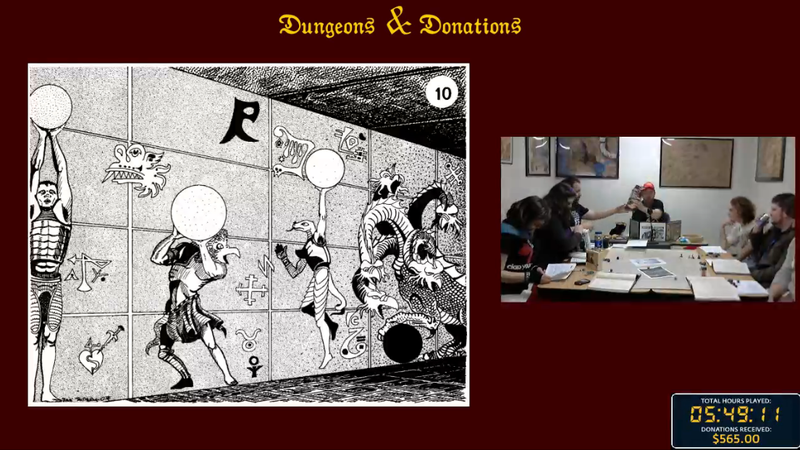 We’ll be running a 24-hour live Twitch stream of heroes trekking through the classic deadly adventure module Tomb of Horrors! $5 gets you a seat at the table, but how long can you hold it? If the perils of the Tomb prove too lethal for your character, you’ll have to pay to keep your seat–or yield to the next player in line! Spectators will have the option to donate various amounts to help or hinder the party on their path. Will you give them the boon of a much-needed potion of healing–or would you rather send them a Beholder instead? As a personal note, I’ve contributed to several Extra Life 24 hour game-a-paloozas, hosted by TheZestyMan and emilieraptor on Twitch. I’ve even been in a few of them, though never hosted one myself. If you have a tiny bit of tech savvy and are willing, it’s a great way to help out the Children’s Miracle Network. You don’t have to watch all 24 hours, but checking in every now-and-again to see how your favorite heroes are doing is a lot of fun!